Today's a big day - I'm Finally 5 Years Cancer Free! Today’s a big day – I’m Finally 5 Years Cancer Free! Five years ago today I said “Goodbye and good RIDDANCE” to breast cancer. It was one of the darkest and most scary times in my life. And yet, one of my most blessed times as well. Sound odd? Believe me, it does to me too. But I guess sometimes when you’re at the lowest and most fearful point in your life, things happen. But I’ll admit that today on the anniversary of that day, well this is an intensely emotional day for me. Although I praise God for my healing, I find I’m still tearful even after this long for experiencing such an intense time in my life. I still find I can’t talk about it without breaking into tears and I know I fall way short of writing what’s in my heart. But I remember it like it was yesterday. Leading up to that day 5 years ago, I’d prayed fervently for God to give me the strength, peace & courage to get through it. And I’d prayed for those things Hard. But as my surgery date of April 12th got closer & closer I was puzzled. God had never failed me before. Even during other hard times in my life when I’d prayed for strength, I was always given it. But here I am about to go through a major surgery lasting several hours that would change me forever, I didn’t feel brave. I didn’t feel confident. I didn’t feel unafraid. Why? Then I reflected on those days leading up to this day. Oh the many angels had tended to me, but I was too enveloped in fear to see it for what it was. There were angels from my church that stopped by with food for RancherMan & me. And there were cards of comfort that filled my mailbox to overflowing. Many calls of encouragement were made and love was shared freely. And one day as I was standing in the exam room about to get a biopsy and tumor marker in preparation for surgery, the technician sensed my fear. As she walked by she stopped and touched my arm. “Are you a Christian?” she asked. Wow. As tears welled up in my eyes I knew she was right. And of course there were friends & family that gathered around RancherMan & me heading toward that frightening day. Even family members who love me but are more comfortable at affection’s arms length were openly supportive & loving. They were there with me on the day of surgery and they waited in the waiting room all those hours until the surgery was over. And in my recovery room my mom presented me with a pewter pocket cross. 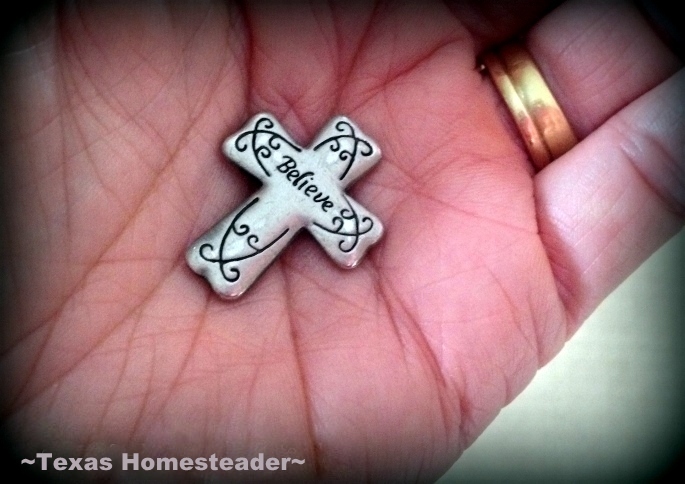 You see, when someone in my family is going through a trial in their lives whether with an illness, a family situation, financial troubles, etc., we carry a tiny cross in our pocket to remind us that we are not alone. That He is always with us. This pocket cross is in my pocket every day now. And it’s also laid on the prayer rail each and every communion Sunday as I give the glory to God for it all. For the love I received, for the angel’s touch, for the healing, and for the true colors in others I’d have never seen otherwise. Leading up to that day I’d been curious as to why God hadn’t held me up as I’d fully expected Him to. But I realize that He DID! God’s ways don’t always look the ways we mere mortals think they will. But He sent His angels in those fearful days. And yes, I felt the loving embrace directly from God Himself. Thank you Lord for being faithful to me. And thank you for my healing! Pretty In Pink: Going Too Far? This entry was posted in Blog Posts and tagged Inspirational on April 12, 2018 by Texas Homesteader. Wow, what a wonderful cause for celebration! God surely did turn your test into a testimony. He’s clever like that! There’s no telling how many people have benefitted from your story and your honesty. Congratulations, and job well done! Congratulations Tammy. July 27 will be my 12 year anniversary. I had a very rough year, that year. August 27 will be 12 years since my mom passed away from a brain tumor. Then November 22 will be 12 years since my dad passed. I had very supportive friends through it all. My dad told me, at one point that he was very surprised at how positive I was through it all. I think we all need to have our own way of dealing with things and mine was being optimistic. I truly think that, that is the gift God gave me, during that time. Congrats again Tammy!!! Congratulations!! I was recently diagnosed with lung cancer and just had my ninth chemo today. I am bald as a cue ball but I am alive and doing well. My husband has just spent the last 26 months with cancer and is now cancer free but I will feel better after he meets the five year mark. Congratulations! That’s a wonderful milestone! Congratulations, Tammy! I’m so happy for you. And for RancherMan. My heart sings when I read about you two together. Like a dream come true and prayers being answered. Looking forward to your 10-year post. Congratulations on your milestone. 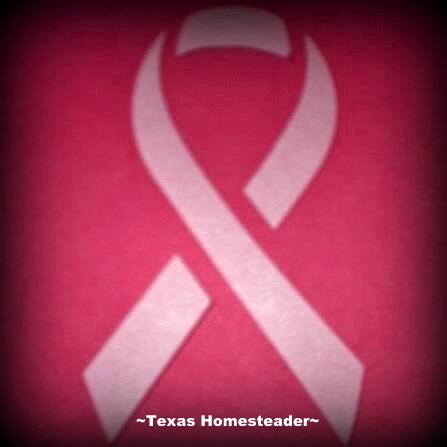 On May 1 this year I will be 18 years out from breast cancer. It is a joy, but as the years pass I don’t even think about it much any more. Re: the fear you felt – remember it is also a gift, one that helps keep us safe from many mistakes and in many situations. Congratulations. Here’s to many more years.